Grassblades is free to read over on its main website, but pitching in and backing me on Patreon nets you some nice extra content - early pages, regular sketchposts, Q&A's, livestreams whenever I'm able, etc. - and the money goes towards keeping the lights on, my tea supply topped up and the website hosting paid for. I make plenty of other things as well - I never run out of things I want to make! - and pledging to my Patreon will allow me to devote more time to making them. Mini-comics, zines, worldbuilding and concept art, illustration projects, etc. If you like what I make, and want to help me keep making them, Patreon's an excellent way of doing that! And remember - no contribution is too small! I love and appreciate backers on all levels. On a regular basis, I'll be making sketchposts with concept art, development sketches, design-babble and behind-the-scenes stuff. Pledging on this level also gets you access to the Q&A's and the extra sketchcomics between Grassblades-chapters! On the regular update-days, backers get access to upcoming pages earlier, staying ahead of non-backers! This is on top of the rewards on the previous tier. Once we hit the 150 USD-milestone, backers on this level and above will be getting regular PDF-collections of sketches and the in-depth posts I make here on Patreon! ETA: Patrons on this tier and above will also be getting access to the Tome of Friends, a growing collection of NPCs for you to use in your tabletop rpg campaigns! While Grassblades is the thing I'm focusing on right now, I do - and have done! - a lot of other stuff too. Backing on this tier gets you access to ALL of that, some of is available nowhere else - and every time I make something new, you guys get it first! This tier currently contains about 400 pages of non-Grassblades comics - including a full black and white graphic novel and all of my winter holiday-comics! Backers on this tier and above also get a vote in, and the chance to choose the theme of, the bi-monthly character design polls! As soon as I'm done with a chapter of Grassblades, it gets turned into a nice, shiny hi-res PDF and sent out to backers on this level! In the PDF are included all the extras from sketchposts and such relevant to the chapter! All higher tiers also grant access to the content on the lower tiers as well. If you want to support me, but can't manage a monthly pledge, you can head over to my ko-fi page and throw some money in my tip-jar instead. * On this tier, you get my undying gratitude, and that warm-glow of satisfaction that can only come from helping someone out. * Access to the regular sketchposts and extras! * Access to pages ahead of everyone else! Backers on this tier get to read next week's page today! * Access to the Tome of Friends, a collection of NPCs for use in your tabletop rpgs games! 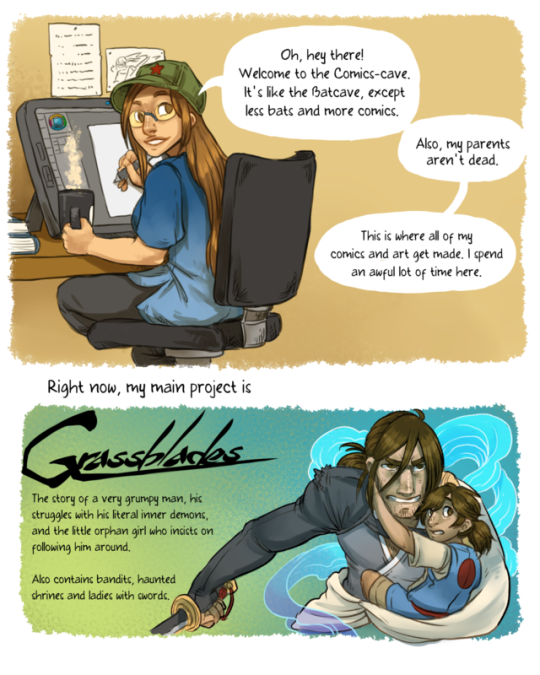 * PDF-downloads of all of the comics and sideprojects I do that AREN'T Grassblades! 400 pages and counting! * A vote in the regular Patreon character-design challenge! * A discount on commissions! Sketchbook-PDFs will be released to all backers on the $3-level and above on a regular basis, collecting the in-depth posts I make on Patreon as well as any WIPs, concept and design pieces, sketches and other things I have lying around. These PDFs will be available to Patrons before going up on Gumroad.